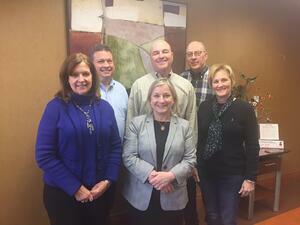 Concannon Miller was honored to host Congresswoman Susan Wild for a business outreach visit. Congresswoman Wild said she is working to meet with many businesses, municipalities and individuals in her first months in office. “A critical part of this job is forming partnerships,” she said. Congresswoman Wild met with a group of Concannon Miller shareholders, directors and managers, who talked with her about the impact of the new tax reform law and the current government shutdown. The CPAs said the new tax law will likely be a mixed bag for their individual clients but is mostly beneficial for their small business clients. The reduced tax rates for small business owners has helped them to invest in equipment, hire additional employees and offset health care increases. The CPAs said the government shutdown has been frustrating for clients who have matters such as audits or tax disputes that have to be negotiated with the IRS. Congresswoman Wild said she is very sympathetic to both IRS and other federal workers along with taxpayers who are negatively impacted by the shutdown. “The shutdown is going to have such an impact on the economy,” she said.